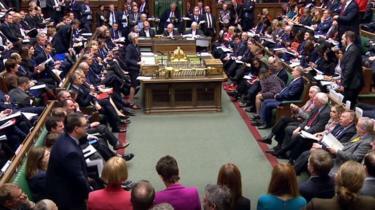 MPs are starting to debate the process of voting on their preferred Brexit options, as Theresa May prepares to meet Tory backbenchers in an effort to win them over to her agreement. Some MPs want the PM to name the date she will leave No 10 to have any hope of getting their backing for her deal. The BBC’s Laura Kuenssberg said some leading Brexiteers were “tiptoeing their way” towards supporting her plan. He told BBC Radio 4’s Today programme he did not “begin to pretend this is a good deal or a good choice”, but he would support the PM’s plan if it had the backing of the Democratic Unionist Party. The 10 Northern Irish MPs are seen as the key to securing the deal, but they have urged Tory MPs to “stand firm” in their opposition unless there were “significant changes”. Meanwhile, the President of the European Council Donald Tusk told MEPs they “cannot betray the six million people who signed the petition to revoke Article 50, the one million people who marched for a people’s vote, or the increasing majority of people who want to remain in the EU”. He said the people “may feel that they are not sufficiently represented by the UK Parliament, but they must feel that they are represented by you… because they are Europeans”. The Speaker will select around half a dozen options, with MPs marking on paper each option with a “yes” or “no”. The process is likely to continue into next week. Ms Leadsom said it was a decision for Mrs May and the chief whip, but added that the votes gave her a “big cause for concern” as the government should be in charge of the Commons. Labour’s shadow international trade secretary Barry Gardiner told Today he expected there to be a free vote for his party’s MPs later, but that they would be expected to rule out supporting a no-deal Brexit and revoking Article 50 in line with their manifesto. Mrs May continues to try to win MPs round to her deal, which has been heavily rejected twice. She is expected to address the Conservative backbench 1922 Committee on Wednesday evening. And during Prime Minister’s Questions – after being told by her fellow Tory MP Andrew Bridgen that his constituents could not trust her to deliver Brexit – Mrs May said she could guarantee delivering on Brexit if “this week” MPs like him supported her deal. 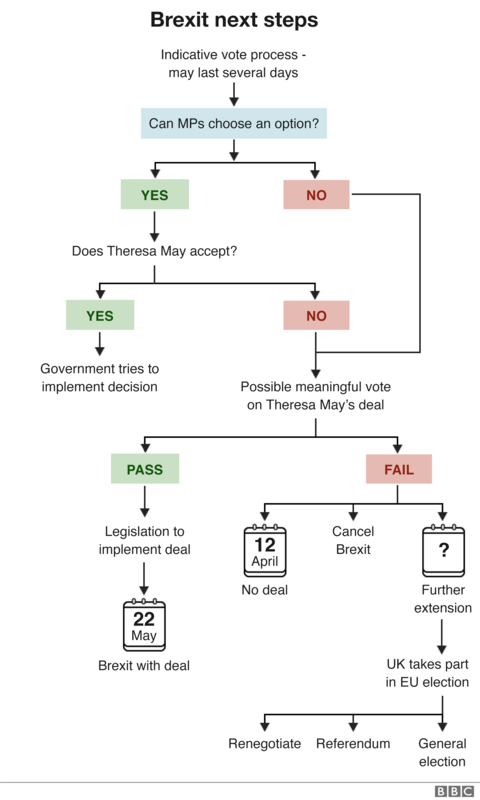 Friday is the day written into law for the UK to leave the EU, but later MPs will vote on a statutory instrument to confirm a delay – with the earliest Brexit is likely to happen now being 12 April. 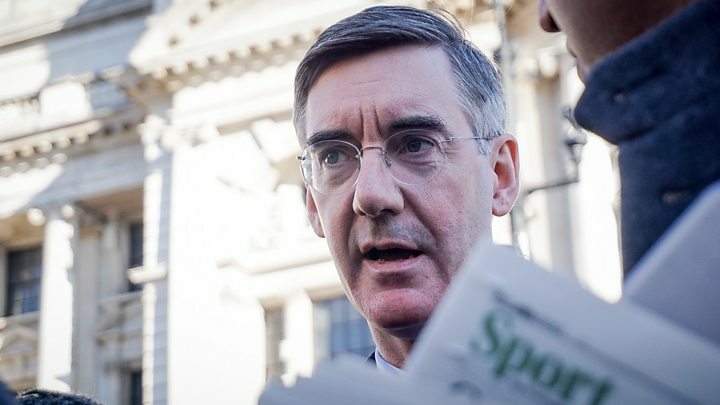 Writing in the Daily Mail, Mr Rees-Mogg – who is chairman of the pro-Brexit European Research Group of Tory MPs – said “an awkward reality needs to be faced” and he was ready to back the deal so long as it won DUP support. Fellow ERG member, Tory MP Daniel Kawczynski, tweeted that he had appealed to members of the DUP to abstain from voting on the PM’s plan if they cannot back it, saying it could be enough to get the deal “across the finishing line”. But ex-Foreign Secretary Boris Johnson told the BBC there was “no point” supporting Mrs May’s deal “without any sign the UK is going to change its approach in phase two” of the negotiations. Otherwise he said he feared the country would be indefinitely tied to the EU’s rules. The DUP’s leader in Westminster, Nigel Dodds, has co-signed two proposals one asking for the result of the EU referendum in 2016 to be respected and another backing the Malthouse Compromise. There was some confusion over the confirmatory public vote option. Labour MP Peter Kyle helped draw up the motion and told Today that he expected his leader Jeremy Corbyn to order his MPs to back it. 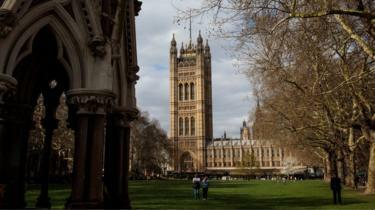 MPs later confirmed to the BBC they had been ordered to support the proposal. Conservative backbencher Sir Oliver Letwin, whose cross-party indicative votes proposal ushered in today’s debate, said he expected MPs to vote for everything that would be “all right” and serve the nation well. He said he still hoped MPs would change their mind to support the prime minister’s deal later this week but if one of the other options gets a majority, “we will have to work with the government to get them implemented”.